Nature keeps amazing me, even in small things! Yesterday, I found a new variety of tomatoes, called Heirloom Tomato. It’s a tomato variety that has been passed down from generation to generation. commercial heirlooms: cultivar introduced many years ago. family heirlooms: tomato seeds passed down for several generations through a family. created heirlooms: crossing of two kinds of heirloom or one heirloom and one hybrid, for creating a new variety. 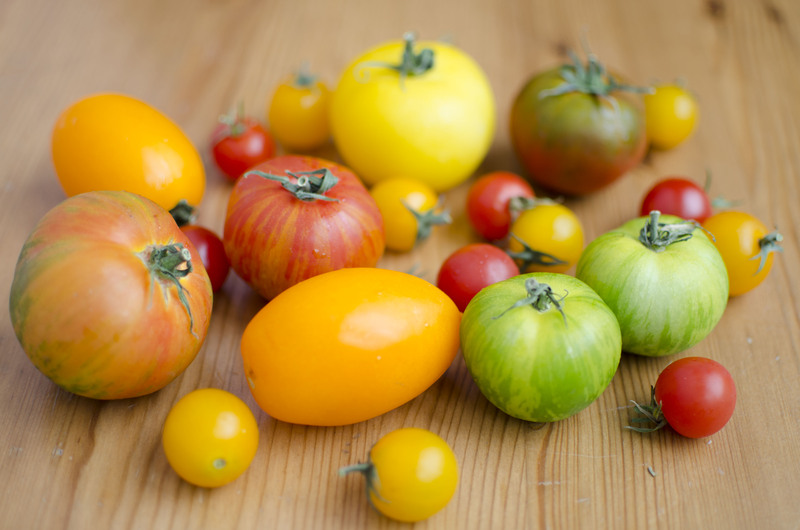 mystery heirlooms: product of natural cross-pollination of other heirloom varieties. Why have they become increasingly popular? Even if they are a bit expensive, you will have an old-time taste, so difficult to find nowadays. Moreover, they have funny names, after the families who created them or… more simply after the place where they were produced first. After tasting them, these are my thoughts. The Coyote is a Mexican wild cherry tomato. It is so sweet and savoury, you cannot stop eating it. It seems like a fruit. The Green Zebra (light green tomato with deep lime-green stripes) has a pleasantly tart flavour. The Cherry Tomato has a round taste: it is sweet with a sharp bite. The Orange Banana Tomato (a yellow/orange oblong tomato) is very meaty, it seems like a San Marzano tomato, but it has a more delicate taste. The Red Zebra (red tomato with golden stripes) has a round and savoury taste. It is meaty and it seems like you put a teaspoon of tomato sauce into your mouth. The Turkish striped monastery (red/orange tomato with green stripes) tastes almost like the Red Zebra, but it is a bit tart and the skin is crunchy. Its name comes from the place where it was cultivated, a Turkish monastery, indeed. The Black Krim tomato (brown/deep green tomato) has a fantastic intense taste and you keep a pleasant slightly bitter aftertaste into the mouth. It seems that this variety is from the Isle of Krim, on the Black Sea. The Garden Peach is a golden yellow round tomato, with a fuzzy skin, like peaches. It has a very peculiar taste, it tastes good, but it is tart and it didn’t taste like a tomato. Now, how did I find them? After running in the rain, we entered a supermarket looking for grape tomatoes. Just for curiosity, I wanted to smell other varieties of tomatoes as well. Yes, my “truffle man” taught me this fantastic criterion for food: the sense of smell! ? I was astonished as I discovered that these tomatoes had the very same smell than that of my hands after harvesting the tomatoes of my family’s vegetable garden in Italy. 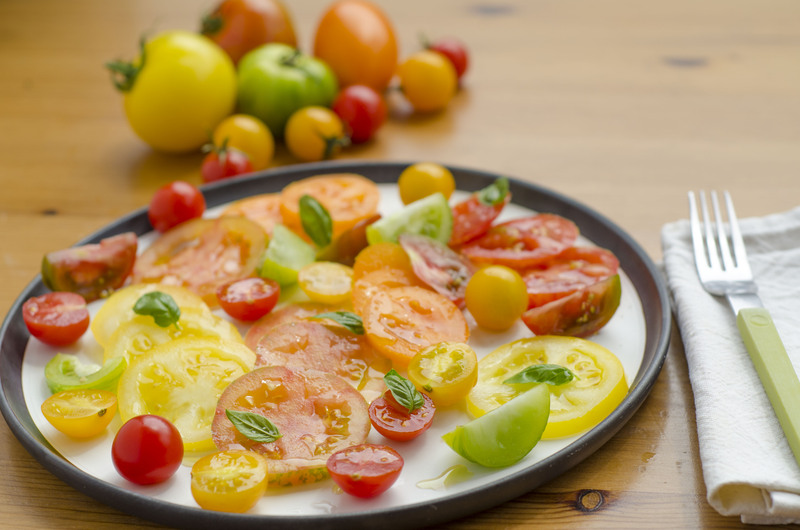 The simplest way to enjoy these heirloom tomatoes is a salad, so I made a tomato salad… delicious!! ? Wash and cut the cherry tomatoes in half, the Zebras and the black Krim into wedges and into slices the other ones. Dispose them on a plate, playing with the different colours and shapes. Season them with olive oil, salt and some fresh basil leaves. Our heirloom tomato salad is ready! ?